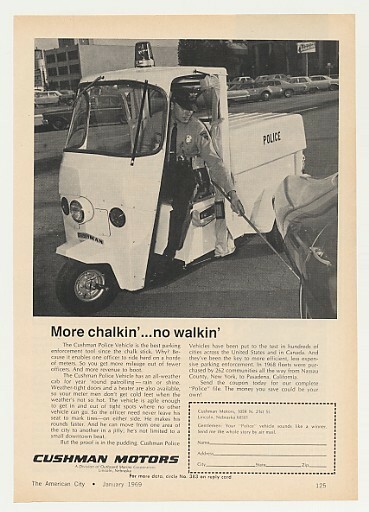 “Rain or shine, receipts from parking meters go up, and the costs of collecting them go down, when the meter patrol in on Cushman three-wheeled Trucksters. Their inexpensive Cushman Trucksters take the meter patrol off their feet, get them around fast and comfortably, even in bad weather, then increase the city’s income from parking meters at the lowest possible cost. 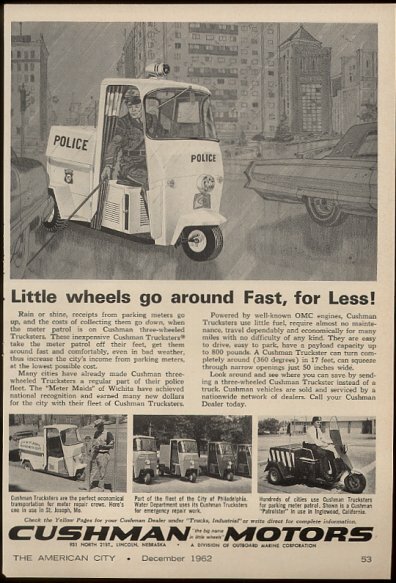 Many cities have already made Cushman three-wheeled Trucksters a regular part of their police fleet. 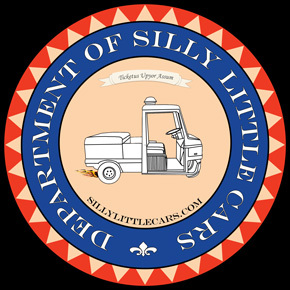 The “Meter Maids” of Wichita have achieved national recognition and earned many new dollars for the city with their fleet of Cushman Trucksters. Powered by well-known OMC engines, Cushman Trucksters use little fuel, require almost no maintenance, travel dependably and economically for many miles with no difficulty of any kind. They are easy to drive, easy to park, have a payload capacity up to 800 pounds. A Cushman Truckster can turn completely around (360 degrees) in 17 feet, can squeeze through narrow openings just 50 inches wide. Reminds me of the tagline in the maintenance manual for my 1983 Truckster, which said “Cushman: slow enough to spot trouble, and fast enough to catch it”. Here’s another one, love the “more chalkin, no walkin” line, I need that on a t-shirt. “The Cushman Police Vehicle is the best parking enforcemnet tool since the chalk stick. ” That’s about all I can read but really it says it all.